Upgraded this summer, this longer fit version, five-season mountaineering sleeping bag is designed for the keen and tall mountaineer and built to deliver protection in high altitude mountain environments and weather conditions. Expert Series The Alpine Expert casts a comfortable and incredibly warm duck down which offers an unrivalled warmth-to-weight ratio because it traps lots of air that will ultimately be kept warm by body heat. The down will also recover all of its puffiness after having been packed. An insulated shoulder collar, inside, seals the heat while the Insulated Shield Construction�, a baffles construction with V-chambers combined with an aluminised film, reflect back your body heat for warmth. A 3/4 length zippered opening with anti-cold flap allows you to slip in. In lab tests, its comfort limit is -11�C and it will cope with colder temperatures, based on on-terrain feedbacks, but it is still less extreme conditions-driven than our World Roof. The expedition fit features a 3D construction that optimizes space with the addition of a contour panel that reduces compression, enhancing insulation, and allows to sleep fully clothed. The bag itself is made of a nylon ripstop fabric for its abrasion and tear resistance and lightweight qualities. It protects the bag from scratches and the down fill from being exposed while remaining packable and easy to carry. A waterproof compression sack will free some space inside your pack and protect the sleeping bag from water and adventure grime. For over 80 years, Millet has been committed to designing ever more technical and efficient products. This commitment to you also serves to protect our mountain playground. Because we want the mountains to be beautiful, we are limiting the environmental impact of our activities. 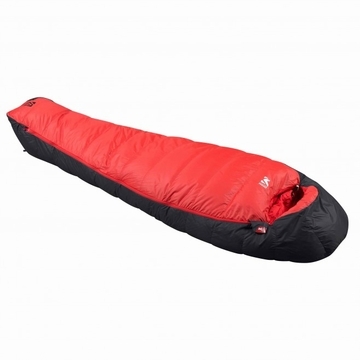 This sleeping bag is rated as a Low Impact� product by Millet through to the use of a Bluesign� and Responsible Down Standard (RDS) certified duck down, which ensures that the down in the products comes from ethically treated animals and that any harmful substances is eliminated right from the beginning of the manufacturing process of the component(s) and standards for an environmentally friendly and safe production are set and controlled.